It is scientifically impossible to hate Winnie the Pooh, or any of his friends from the Hundred Acre Wood. Regardless of whatever incarnation you’re experiencing them in, whether it’s the original stories by A.A. Milne or the various Disney projects, the bear of very little brain and his many companions are so loveable, innocent, and heartful to be around that they can brighten up the day of the least happy person in the room. It’s no wonder why these characters, from Pooh to Tigger to Piglet to Eeyore and so on, have gone on to become some of the most popular characters in not just Disney history, but of all forms of media, period; they are just so good-natured and universal that it should be a crime. In fact, their presence is so strong that they can instantly make any project they’re involved in even better; Christopher Robin, the first live-action/CG hybrid outing for the characters, was already a nice little family film, despite a very familiar plot, but the inclusion of these timeless characters really does work wonders in its favour, and makes you yearn for more adventures in this wondrous and enchanted world. 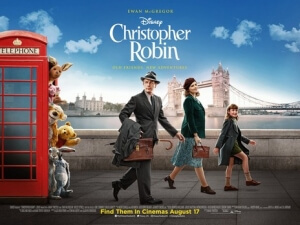 The plot of Christopher Robin focuses on, well, Christopher Robin; the animals’ young human friend who was always there for them whenever they were in a spot of bother, is now all grown-up (and looking very suspiciously like Ewan McGregor), and has settled into a life of work at a luggage company in London, which proves to be so time-consuming that he’s all but neglected his wife Evelyn (Hayley Atwell) and their young daughter Madeline (Bronte Carmichael). When Christopher’s boss (Mark Gatiss) forces him to work over the weekend on a proposal to lay off 20% of the company, he must forsake a promised trip to the countryside with his family, leaving him all alone for a few days without his disappointed wife and daughter. Things seem hopeless for poor Christopher Robin, until Pooh (voiced by the character’s regular voice actor Jim Cummings) unexpectedly stumbles back into his life, as he searches for his missing friends in the Hundred Acre Wood, prompting the grown Christopher to make a sudden return to his childhood world, where he also reunites with Tigger (also voiced by Cummings), Piglet (Nick Mohammad), Eeyore (Brad Garrett), Rabbit (Peter Capaldi), Owl (Toby Jones), Kanga (Sophie Okonedo) and Roo (Sara Sheen) who all help him rediscover his inner child at a time where it’s sorely needed in his over-worked life. This is a plot that you’ve certainly seen before, most notably in Hook which instead of Winnie the Pooh took inspiration from Peter Pan, and the comparisons will probably be too great for you to ignore if you’re a fan of that divisive Spielberg film. In the case of this movie, however, while it’s definitely not a very original story it still works well enough for it to be a sweet and effective movie on its own, and to be honest this one has a bit more heart and sincerity to it than Hook does, which makes it a bit easier to swallow. This feels like a movie which was made by people who seriously adore these characters and stories, from the simple and straightforward writing to the gentle and comforting direction by Marc Forster (who, speaking of Peter Pan, also made the 2004 J.M. Barrie biopic Finding Neverland, which at times feels like a natural predecessor to this movie), and unlike some of the much more divisive live-action Disney adaptations of recent years it doesn’t come across as some quick cash grab for the studio (because really, does Disney NEED any more money? ), and more like this was a story they desperately wanted to tell in this world. As such, the filmmakers never talk down to the audience, and always assume that they’re on the same page at all times without having to stop and explain what’s going on for those that can’t catch up, in a respectable and delicate manner that makes this a far more accessible movie of this type of calibre than, say, Maleficent or even last year’s Beauty and the Beast; unlike those movies, especially the latter, I don’t see many people having a major problem with this one. Outside of writing and direction that really seems to understand the world of the Hundred Acre Wood and its eccentric inhabitants, it’s just a really pleasant and irresistible movie, with impressive visual effects that bring the stuffed animals to realistic life – and to those who think that Pooh and his friends look scary or unnatural, what on Earth did you expect; these characters are and always have been stuffed toys, and when you put them in a live-action setting, guess what: they look like bloody stuffed toys! Your opinion is your own, but I personally think that anyone who refuses to accept their designs here are just looking for excuses to crap all over this film, merely because it’s a live-action Disney remake which must mean it’s automatically THE WORST, according to some of the annoying Disney purists out there… okay, rant over; back to the review – and charming acting either in front of the camera, particularly McGregor who’s rarely ever not engaging, or within the voice booth. One of the best decisions made during the making of this film was getting Jim Cummings back to voice Pooh, because not only does he replicate original voice actor Sterling Holloway’s distinctive voice down to a tee, but his is a voice so tender and as sweet as honey that it has become synonymous with the character, and to have anyone else voice him would just be wrong (the same can be said as to why Cummings additionally replaced original voice actor Chris O’Dowd as Tigger). The other voice actors, many of them more recognisable names, do just fine even though at times they can sound a little off than what we’re used to hearing (Nick Mohammad’s British accent as Piglet takes some getting used to, but other than that he’s perfectly fine). It’s a gorgeously shot movie too, perfectly capturing the gloomy and almost wasteland environment of the Hundred Acre Wood when Christopher Robin finally returns after many years, but also the sunny and beautiful skies which appear when needed the most. The filmmaking, writing, direction, acting, and especially the presence of these wonderful characters just as we know them are all major pluses about Christopher Robin, and although the story is definitely nothing new, you’ll be having such a lovely time in the Hundred Acre Wood to really care all that much. Christopher Robin is an effortlessly charming and endlessly loveable live-action take on Winnie the Pooh and his friends from the Hundred Acre Wood, who are all brought to life by strong direction and faithful writing that treats the audience with respect.